Facets of the recent strikes by ANCL staff photographers. 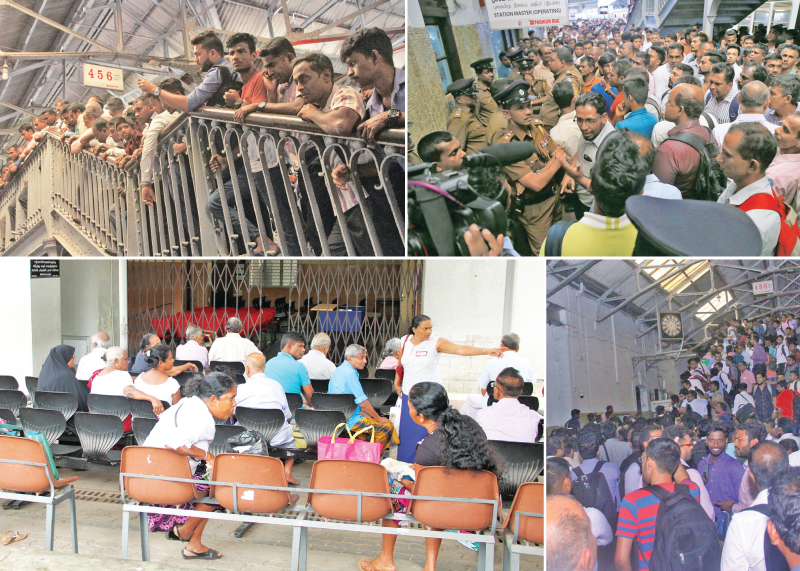 The recent spate of strikes staged by the Railway workers, doctors and private bus operators has drawn heavy criticism from the general public and has also raised doubts as to whether these striking parties were in fact fighting for their rights or if these strikes were politically motivated. The recent Railway strike left commuters stranded by evening, unable to return to their homes as the strike was sudden. 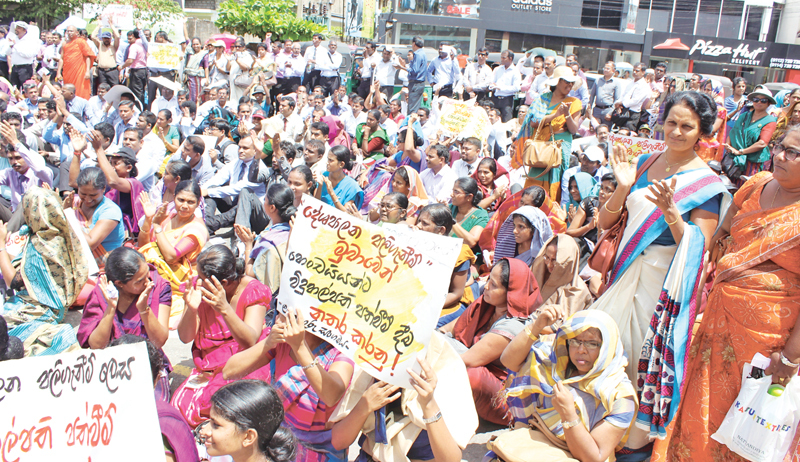 However, despite Railway trade unions’ demands and refusal to call off the strike, Finance Minister Mangala Samaraweera was adamant and refused to give in. The strike was eventually called off without any gain, which only inconvenienced the public. The Daily News spoke to a cross-section of society in a bid to get their views on these recent strikes. The Media Secretary of the Transport and Civil Aviation Ministry, Viraj Abeysinghe noted that although it could not be said definitely if there was some political agenda behind these strikes, the manner in which these sudden strikes have been conducted and the failure to try all other options prior to launching such strikes, gives an indication of some political backing or agenda. “They operated normally in the morning and people came to work as usual, but suddenly they announced a strike and the commuters were all stranded, unable to get back to their homes in the evening. They put the people in great difficulty by this,” he said. Abeysinghe noted that in such instances it was very clear that these strikes were being carried out with the aim of putting the government into disrepute. “Some demands put forward by these striking unions were justified and fair, but most of them were not. The government cannot simply agree to raise the wages of just one government institution and not provide the rest of the institutions the same privileges,” he said. Currently, the government has to bear the burden of repaying huge debts and as such it is not possible to take on the added burden of salary increments, said Abeysinghe, adding that these increments have to be in accordance with all other government institutions. “This is why the government cannot grant the demands put forward by Railway workers,” he said. Due to the recent strikes launched by the Railway workers, the Railway Department had to incur losses exceeding Rs. 70 million per month, in addition to its running at a Rs. 40 million loss anyway. The Railway Department is not a profit-making institution, but it should not be running at a loss either. According to Abeysinghe, the Railway Department cannot keep running at a loss and it has also been proposed to increase the railway fares in order to cover this loss. “The Railway fares have not been increased in over six years. Although we don’t need to make profits, we cannot keep running this department at a loss either,” he said, adding that under such a situation, the demand by Railway workers to increase their wages was definitely unfair. According to a member of the GMOA who did not wish to be named, the strikes by the doctors cannot be condoned, especially as it deals with the lives of low-income patients. He said in the past, although several strike actions were staged, it was only as a last resort, after having held discussions and bargaining on their demands. But, today there is no discussion of their issues or bargaining; all of a sudden the doctors struck work, leaving the patients stranded. These trade unions are established mainly for the best interest of the workers, but the recent doctors’ strike over the Singapore free trade agreement has no relevance, raising suspicion on whether these strikes are launched for political purposes rather than for the rights of doctors. The GMOA member said that it seems as if some political powers are using the GMOA to achieve their goals. He said due to these strikes, medical faculties have been closed for a year, which in turn would create a shortage of medical interns in the future. He said certain GMOA members were using their GMOA membership for political purposes. The doctors have been given pay hikes although they strike. In fact, their extra duty allowance has been increased by around Rs.10,000 and their basic salaries have been doubled. All in all, the GMOA member said that the government had increased doctors’ wages by over Rs.50,000 since coming into power. Hence, the motive behind these strikes is questionable, as it does not seem to have any justification, as the doctors have already benefitted far more than many other professions have. Meanwhile, the following are several views expressed by the public on the recent strikes.